Photography first appeared in the United States in the form of small, miraculously detailed, shiny, flickering images on silvered copper plates, protected behind glass, and packaged in cases resembling reliquaries or jewel boxes. In a democratic age in a new nation, the affordable means of portraiture they provided was certain to attain vast popularity; in an age of rapid scientific progress and popular interest in the sciences, their fusion of optics and chemistry into an artistic medium engaged that enthusiasm; and in a society prideful about its triumphs in invention and technology, the ingenuity of the new medium was taken to heart and refined. By 1851, the daguerreotype was sometimes known as “the American process,” despite its invention by a Frenchman, and at the Crystal Palace, the exhibition of American daguerreotypes dazzled the crowds, so that in the words of Horace Greeley, “In daguerreotypes, we beat the world.” (2) The daguerreotype remained the most important photographic medium in the United States until the Civil War, a longer span of preeminence than it enjoyed elsewhere. 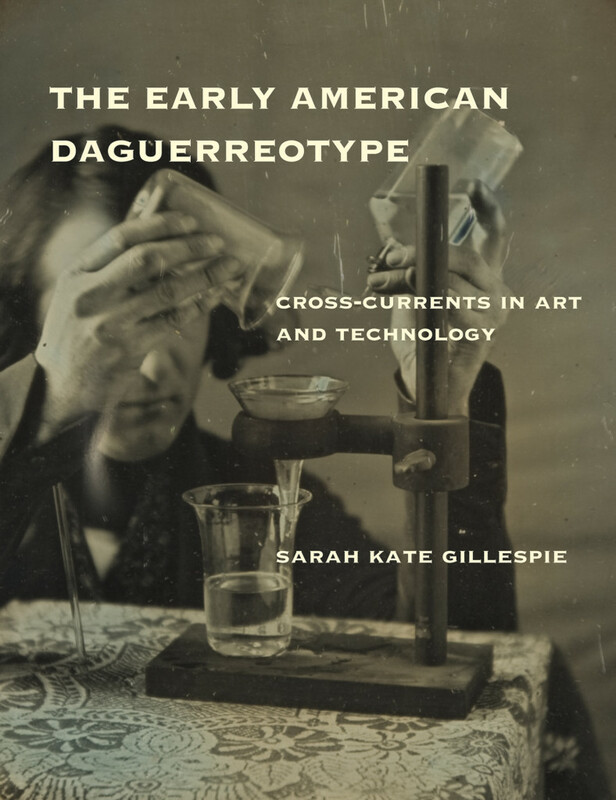 Sarah Kate Gillespie’s The Early American Daguerreotype: Cross-Currents in Art and Technology explores the first dozen years of the daguerreotype in the United States in terms of the relations of art, science, and technology, whose fusion produced an unprecedented kind of object. This engaging and thoughtful book approaches the American daguerreotype though contextual and formal analysis. It also shares with the subject of the daguerreotype an exceptional clarity and an ability to capture a broad slice of the world within a small compass. Many scholars have explored this topic since Beaumont Newhall, the founding father of the history of photography in the United States, broached the subject in The Daguerreotype in America in 1961. Gillespie’s text is, however, one of the first art historical treatments since Newhall to address the reasons for the importance of daguerreotypy in photographic history and American visual culture. Using several daguerreotypists as exemplars, Gillespie explores the ways in which their medium participated in definitions—and redefinitions—of art, science, and technology, while simultaneously being shaped in turn by each. Gillespie begins with an account of Samuel F. B. Morse, known to every American schoolchild as the inventor of the telegraph. He is less widely recognized for his role as one of the most respected American painters of the early nineteenth century and one of the earliest photographic experimenters. The list of people who almost invented a workable photographic process before Nicéphore Niépce, Louis Daguerre, and William Henry Fox Talbot is long. The name of Morse may also be inscribed on this list, as one of many who gave up on producing fixed negatives. Gillespie explores Morse’s relatively brief involvement with daguerreotypy in relation to his more sustained practices as a painter and as inventor of the telegraph, summarizing all three endeavors as “forms of communicative representation through transcription of a subject via mechanical means.” (52) Her thoughtful reading of a daguerreotype by Morse and William Draper, which represents a still-life welter of several prints, sheet music, a chemistry textbook, and some darkroom accouterments, is linked to the larger discussion of Morse’s involvement with mimetic technologies. She argues that this still life “offers a promise that the daguerreotype has the potential to revolutionize art’s relationship with the sciences and technology.” (46) This image concretizes the overlapping Venn diagrams of art, science, and technology that compose the subject this book explores. Early daguerreotypy reveals that the art and science of photography overlap where each incorporates technology, and as technology was associated with the idea of progress, American audiences were quick to embrace the daguerreotype and utilize it as an expression of American industry and progress. The daguerreotype was populist in appeal and indexical in relation to the known world, attributes that nevertheless coexisted with an aura of magic: a technological marvel for a new nation in a modern world. The daguerreotype was a product of science and technology, but that product was an image, and Gillespie is ever mindful of the importance of reading daguerreotype images in relation to her arguments about the place of the medium in American intellectual and mechanical history. Gillespie proposes that daguerreotypy was accepted and popularized in the United States in part because American society was already keenly interested in image reproductive technologies and the circulation of images. Her analysis of the reception of the daguerreotype process considers how artists reacted to the daguerreotype and how daguerreotypists positioned themselves in relation to art. The daguerreotype changed American visual culture and was changed by it. This book itemizes the ways this is true in the spheres of art, science, and technology. Its relationship to the fine arts is the most complex of the three, in part because the arts were relatively more established in America in the 1840s than the sciences and technology. Initial fears that the daguerreotype would sideline painting and engraving were assuaged by the recognition that it was less capable of the art of flattery as practiced by the portraitist in painting, and by the value of the daguerreotype as an accurate means of reproducing paintings and sculpture. The relationship of the daguerreotype to the fine arts needed to be created, first through its reproduction of fine art, and then by its becoming artwork in its own right. Daguerreotypists began taking over spaces formerly used as artists’ studios. Those physical spaces in turn became public spaces for the display of images, as well as workshops for image creation. The social space of the daguerreotype studio, where the public interacted with existing images as well as commissioning new ones, became a model for painters of the next generation, whose studios often became spaces of display that were attractive to visitors. Samuel Morse also plays a central role in Gillespie’s discussion of the daguerreotype and science. Originally a highly successful painter, then an inventor and scientific experimenter, Morse lost professional standing among artists through his involvement with science and technology, and he failed to gain it among the scientific community because of his origins as an artist. The overlapping spheres of art and science, and the contestation for official recognition of expertise, becomes important when Gillespie discusses the daguerreotype and science, noting that “as with fine art, the daguerreotype was entering a realm in which scientific imagery already circulated.” (110) Gillespie claims that the American scientific community of the 1840s was not yet ready to embrace daguerreotypes entirely, demonstrated by the fact that early scientific daguerreotypes, such as Draper’s monochromatic images of the solar spectrum, needed textual accompaniment to convey their visual information properly. This, however, had transformed by 1856, with the appearance of Draper’s treatise on human physiology, illustrated with woodcuts after his photo-micrographs. By this time, the evidentiary value of a woodcut translated from a daguerreotype was clear. Identification of the daguerreotype as an American process meant coopting a European invention by declaring an exceptional degree of mastery. Yet Gillespie shows that many of the most important early daguerreotypists, like Morse, did not follow through by practicing the profession they helped to create, apparently not wishing to operate as professional photographers. (158) This imparts a curious brevity and quality of interruption to one aspect of the history of early American daguerreotype production, which is surprising given that the medium endured longer in the United States than in other nations. Gillespie argues that while American daguerreotypy entered “an existing culture of practitioners” in relation to fine art and science, it played a different role in relation to technology—then a new category of endeavor—participating instead in its formation. (165) She also argues that the materiality of the dageurreotype as a process that required considerable tinkering in production is partially responsible for its continuing popularity in the United States. The process proved congenial to American mechanical improvisers, who prided themselves on their practical abilities. This volume provides an excellent opportunity to reflect upon the value and validity of the often decried practice of judging books by their covers. The cover features a detail of a daguerreotype picturing Robert Cornelius pouring chemicals from two beakers, which was used to create a woodcut illustration for the 1850 Encyclopedia of Chemistry by James Curtis Booth. It emblematizes Gillespie’s arguments about the position of the medium at the conjunction of American science, technology, and art. The handsome cover also accurately predicts the high quality of reproductions within, as well as the design of the book itself. Daguerreotypes are notoriously difficult to reproduce, owing to their reflectivity and shimmer, but each of the plates illustrated is lucid and distinct in appearance from the others. A plate by Joseph Saxton of Central High School, Philadelphia is particularly notable in this regard. An unusually orange-toned and particularly elusive image under normal viewing conditions, it here reveals itself with impressive fidelity to the original. One of the virtues of this very fine book is its discussion of seldom seen and little-known daguerreotypes in combination with those generally considered important. Henry Fitz Jr. is justly celebrated for his striking 1839 self-portrait, but an obscure image of a broadside advertisement from 1840–42 for his daguerreotype studio is stunning. Laterally reversed, like all uncorrected camera images, it combines bold marketing with a touch of mystery and is “a meditation on the act of representation itself.” (142) Such a meditation, like many of the other daguerreotypes discussed in this book, amounts to a form of epistemological inquiry. Seeing as knowing is at the heart of photographic practice, and the early daguerreotype in America afforded many interlocking opportunities for vision and knowledge, photography, art, science, and technology to converge and to support each other. The story of the American daguerreotype as it flourished is paradigmatic of the evolution of the photographic medium, its ability to incite and reflect change, and its continuing closeness to technology. Gillespie presents the story of the daguerreotype in America not as a chapter in a separate history of photography, nor as a subplot in the larger narrative of American art, but instead as a complex phenomenon that requires an equal consideration of science and technology in informing our understanding of the emerging practice in the United States. The effect of the daguerreotype on the visual and scientific culture of the 1840s and early 1850s hinges upon its hybridity and its affiliations with technology. Interdisciplinarity is a value frequently invoked today but seldom fully achieved in scholarship. Yet in this book, interdisciplinarity is inherent, fundamental, and illuminating, instead of a mere method applied to investigations in a single field. Rather than describing “cross-currents,” as its title proclaims, Gillespie’s book does the harder, better work of presenting the American daguerreotype as a whole, revealing much about images, their makers, and their audiences. Cite this article: Ellen Handy, review of The Early American Daguerreotype: Cross-Currents in Art and Technology, by Sarah Kate Gillespie, Panorama: Journal of the Association of Historians of American Art 3, no. 2 (Fall 2017), https://doi.org/10.24926/24716839.1622. About the Author(s): Ellen Handy is Associate Professor of Art History at the City College of Art, New York.